Organizations are increasingly becoming Open Source Software (OSS) adopters, either as a result of a strategic decision or just as a consequence of technological choices. The strategy followed to adopt OSS shapes organizations’ businesses; therefore methods to assess such impact are needed. 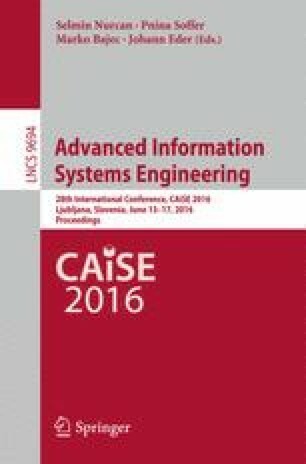 In this paper, we propose OSSAP, a method for defining OSS Adoption business Processes, built using a Situational Method Engineering (SME) approach. We use SME to combine two well-known modelling methods, namely goal-oriented models (using i*) and business process models (using BPMN), with a pre-existing catalogue of goal-oriented OSS adoption strategy models. First, we define a repository of reusable method chunks, including the guidelines to apply them. Then, we define OSSAP as a composition of those method chunks to help organizations to improve their business processes in order to integrate the best fitting OSS adoption strategy. We illustrate it with an example of application in a telecommunications company. This work is a result of the RISCOSS project, funded by the EC 7th Framework Programme FP7/2007-2013, agreement number 318249. It was also supported by the Spanish project EOSSAC (TIN2013-44641-P).